Not all mouthwashes are created equal. And most mouthwashes are placed into two categories: cosmetic mouthwash and therapeutic mouthwash. Therapeutic mouthwashes are available both in the aisle at the grocery store and by prescription. Therapeutic mouthwashes help to combat bad breath, fight gingivitis, and even control plaque. But how? The condition of having bad breath, called halitosis, is caused by several things including: food breakdown and oral disease (pervasive plaque and bacteria). Now, for a mouthwash to fight these problems, it needs to have antimicrobial ingredients. These ingredients have long names like, chlorhexidine (chlorhexidine is an active ingredient in mouthwashes given out by prescription), chlorine dioxide, and, the less chemically-sounding, essential oils (usually therapeutic mouthwashes with essential oils are found in the aisle at the grocery). These antimicrobials have proven effective at combating halitosis. But, mouthwashes are only effective at removing plaque and bacteria from the mouth when they’re used in conjunction with brushing and flossing. It all comes back to a good quality everyday oral care routine. Now, there are certain rules to using mouthwash. Don’t swallow it, and don’t give it to young children, even if they understand how to spit the mouthwash back out of their mouths properly. A child who swallows large amounts of mouthwash may suffer the consequences of diarrhea, vomiting, and (it’s possible in higher doses) intoxication—if your child has ingested enough mouthwash to be intoxicated, call poison control. Now, there’s no best way to incorporate mouthwash into your daily oral care routine. 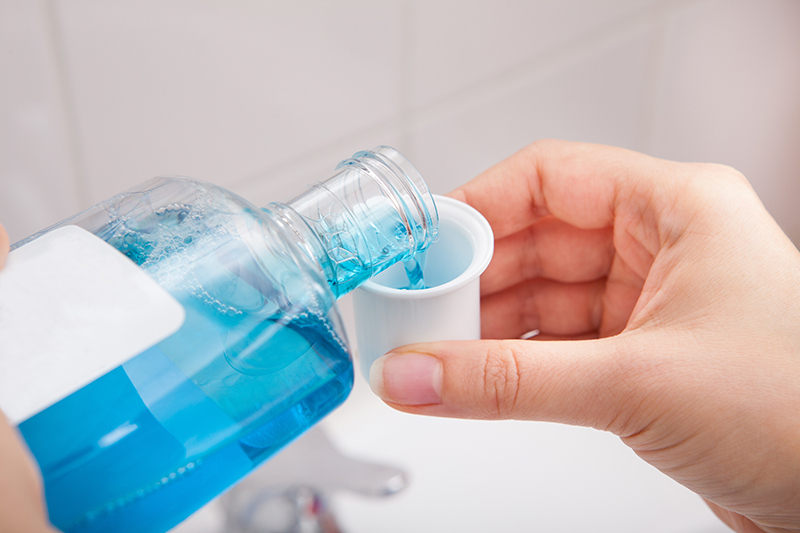 If you brush first, you may want to swish out your mouth with water before you use mouthwash. Other than that, it’s personal preference. It’s most important that you are brushing at least twice every day, and flossing at least once. If you are concerned about halitosis and what’s possibly causing it, make an appointment with Dr. Manhart. He can check for signs of oral disease—remember, it’s best to catch gum disease in its earliest stages, when it’s easily treatable—and develop an action plan to get it fixed.